Galvanised pergola hooks or pot plant support hooks in a variety of lengths and round ends can be supplied. All hooks are made in Australia. If you require something special in a hook i.e.square end, round end, coloured differently, speak to us about the different options available. We can also make a variety of storage hooks for your shed, your bike, your tools, or your workshop. 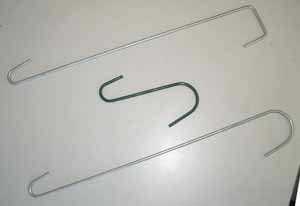 General purpose S hooks or pergola hooks or support hooks in a variety of lengths and round ends can be supplied. If you require something special in a hook – square end, round end, coloured differently, speak to us about the different options available. MSI can manufacture a basket to suit your requirements whether it be a terrace basket, an internal storage basket or a conduit for cables. Made from a mesh welding operation, all baskets are made in Australia and can be coated in nylon for finish or by powder coating or by plating. MSI manufactures a heavy duty coat hanger suitable for hanging very heavy coats, including marine coats and wet suits. Parts can be produced in either galvanised finish or coated in a nylon finish. Our Standard hanger uses 5mm wire but we have the ability to use heavier material for a very heavy application. These hangers have applications in numerous areas and provide an effective solution where a typical coat hanger in wire or plastic would not be suitable. MSI can produce other designs to suit special applications if a standard hanger does not quite do the job. Pictured is a standard diving BCD on the hanger and a close up of another hook to hang diving regs.